Paris in August is a relaxed, almost sleepy city. Traffic was so calm that we made it from the plane to the apartment in a record breaking 45 minutes. Many Parisians were still on holiday and the streets were quiet and easy to navigate, both by car and on foot. The tourist areas around the Louvre and the Notre Dame were still pretty dense, but I can’t remember the last time I was able to have a free full stride down rue Francs Bourgeois. Sure, some of the little shops were closed for the August holiday, but all of our favorite restaurants and department stores were open, the markets were overflowing with fresh fruits and vegetables, fish, cheeses and meats, and the museums were welcoming anyone who had the entrance fee. 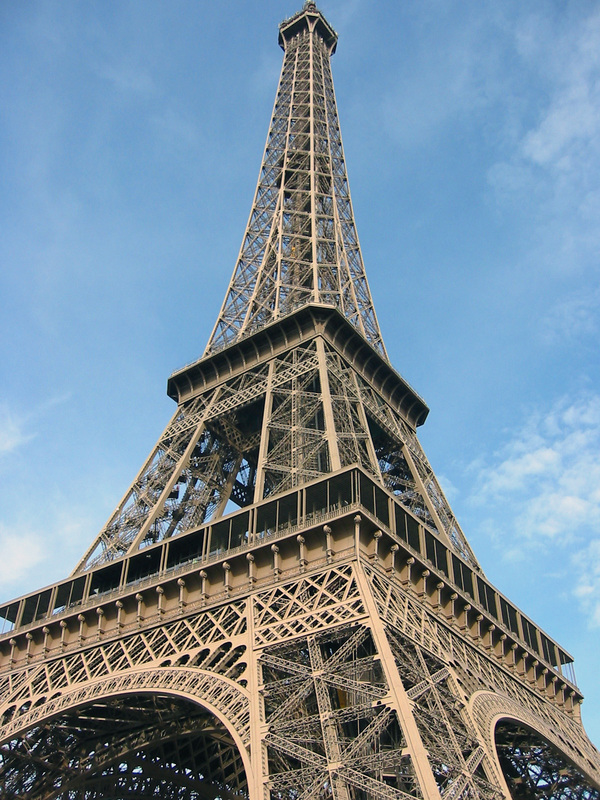 There were the added surprises of free music concerts and the 60th celebration of August 25th 1944 liberation of Paris. By the time we arrived, most of the festivity had ended. We missed the parades of tanks and costumed 1940’s soldiers that closed off many boulevards, the grand 1940’s costume “swing” ball in Place Bastille and the private parties that engaged every party planner in the city, but we did get to see them loading out the grandstands, lighting and audio systems. We also saw the French tanks (les chars) being maneuvered back into their tank trailers, ready to go back to whatever museum they came from. In the original parade in 1944, as Charles de Gaulle entered the Place de la Concorde from the Champs Élysées a German sniper, still in Paris, took a couple of shots at the crowd around him. No one was hurt and there was some speculation as to whether it was a stunt just to prove the invincibility of de Gaulle. At any rate, in 2004, when Jacques Chirac walked down the Champs Élysées and turned into the Place de la Concorde, no one was fired upon. Last summer’s heat wave might have scared away travelers to Europe, but this summer was mostly cold and rainy. Yet, even with the lower temperatures, our renters got plenty of use from the air conditioning; what a whopping bill we got for June and July. We caught a few grey rainy days when we first arrived but an early Autumn arrived by the last week of August; bright sunny days and cool nights. Strangely enough, the Parisians refer to this as “Indian Summer” as if it was their own expression. Who knows, maybe it is? We spent the week repairing broken doors, tightening screws, building new shelves, replacing dishes and glasses, cleaning behind the furniture and washing towels. Those of you with rental apartments are probably smiling right now. Gretchen must have spent four days cleaning and doing laundry. We brought over large, thick towels from the US. Oh how we hate those wimpy thin European towels you find so often in apartments and hotels over here. Unfortunately though, our cleaning staff washed our big American style fluffy towels and air-dried them into large stiff sheets with the consistency of a dry loofah sponge. Luckily there’s a big industrial laundromat across the street. Hopefully, this is the end of the crunchy towels. And so, one again we left the apartments in what we considered to be a “really beautiful condition” and ventured off to pick up our leased car. If you rent a car for longer than 17 days, check out the lease a car program from Renault or Peugeot, you buy the car, but only pay for the time you use it. You get a brand new vehicle with all insurance and when you return it, you sign the papers back to them. It’s just as easy as renting a car only much less expensive. You can lease a Peugeot or Renault through http://www.europebycar.com. You can also go directly to Renault USA at http://www.renaultusa.com. Personally, we like the Renault lease a little better. 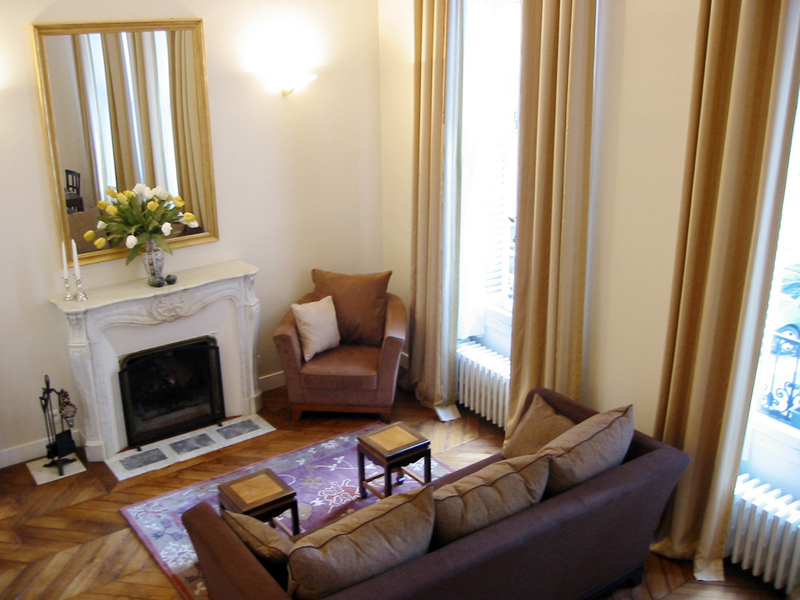 It’s less expensive, you can deal directly with them in the US through their New York office, they have good pick up and drop off locations, including a convenient location in Paris and the agents in France speak English (if you are have any language problems). Oh, one other thing. They give you a car manual in English when you take possession of the car. This alone is worth the price. The only thing you’ll need to do is gas up the car. They’ll give you enough gas to make it to the gas station around the corner. 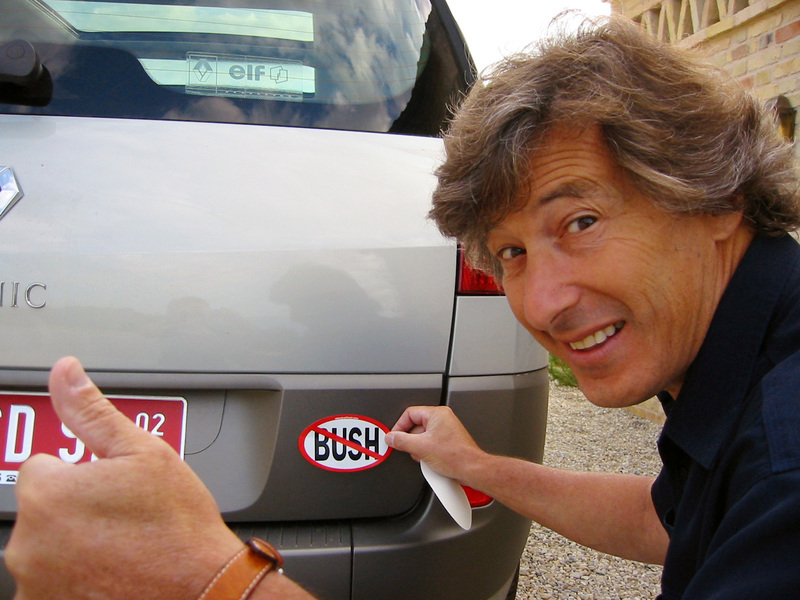 All that was left to do was put the “NO BUSH” sticker on the back of the car and we were off to Normandy and beyond for a 6 week holiday (see other posts from 2004). 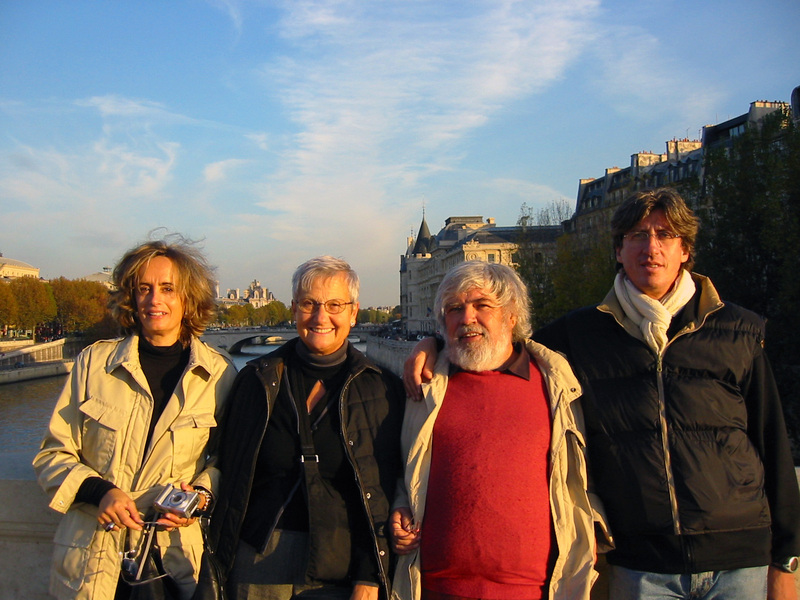 We came back to Paris at the end of October. Traffic was worse than when we left but we were able to navigate the Renault Megane Scenic through the small streets of the Marais, drop off the bags at the apartment on rue des Tournelles and get back to the Renault dealership without much trouble. The agent was so charmed with the NO BUSH sticker on the back of the car, that he gave us a handful of the French European Union stickers for our cars in America. I thought it was a very fair trade. Fall has come to Paris in the form of grey skies and rain. And even though it feels and smells like rain, it takes a long time to get here. Everything in France seems to take a long time. A restaurant meal can easily be a four hour affair. It seems to take forever to get any assistance from the store clerks at the Parisian department stores, they’re usually too busy talking to each about where they’re going to lunch or where they’ve been to lunch. And then there are the beaurocrats. Our building sprung a water leak last April. The insurance agent is finally making a visit to see the damage next Wednesday, October 20th, over six months after the claim was made. And yes, it takes a long time for the rain to come. I look out the window and see the dark clouds. I open the window and feel the moisture in the air. I look at the internet forecast and see rain, rain, rain for the next 10 days. Eventually, a 10 minute light rain hits the ground and then there’ll be blue skies for about an hour. And then the grey mass returns and we wait for the next wave. We are creatures of habit in Paris and our first instinct is to return to our comfort zone, which for Gretchen is over at the laundramat and for me, it’s onto the BHV, my favorite department /hardware store. I’ve been there so many times over the past year, they actually remember me. I don’t know if this is a good thing. It’s hard to understand the expressions of the French faces when they see me. 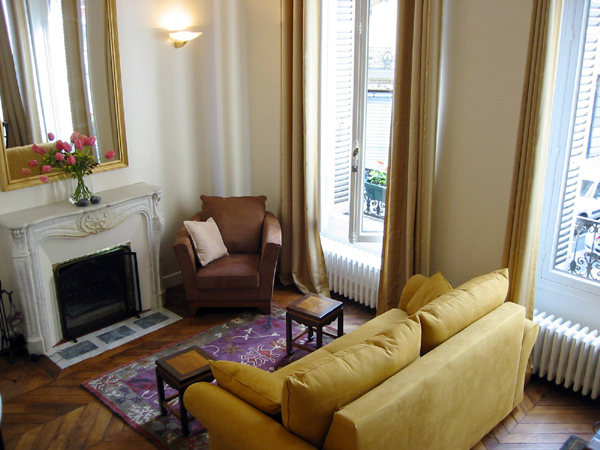 When we started our home in Paris adventure, we were told to buy a sleeper couch so that our comfortable two bedroom apartment could expand to accommodate six people. The mantra of the people who helped us set up the rental business was “profitability, profitability.” The more people you cram in, the more money you make. The first mistake we made was in the choice of fabric for the sofabed. The gold microsuede just didn’t hold up to the spilled wine and chocolate handprints. The second mistake was in choosing the super deluxe model where you didn’t need to remove the cushions to pull the bed out. In fact, the cushioned are sewn into the sofa, which makes it extremely difficult to take the soiled material to the dry cleaner. At one point, one of the cleaning staff noticed a zipper in the rear of the cushion and tried to remove the seat, but instead broke the zipper, which caused the foam innerds to spread into a most unusual flattened shape. And, of course, the fabric doesn’t quite fit this new shape. Oh well, neither Gretchen or I liked this sofabed. I agreed to buy it because I thought she liked it. She agreed to buy it because she thought I liked it. But as it turned out, we both hated it. Kind of like an O’Henry story in reverse. Well, the good news is that we went over the Bon Marché and bought the couch we both liked when we first started looking for furniture over a year ago. We already have the chair from the same line, so in January we’ll have the matching comfortable couch. And in January, our two bedroom apartment will have a maximum occupancy of four people. We are living as Parisians. Mostly, our days are spent in the Marias, continuing our apartment improvements. Gretchen turned the dining room into a sewing factory and less than a week later, we have sheer drapes on all the windows, new bedspreads and new bedskirts. They are beautiful and add so much to the apartments. It’s the finishing touches that really complete the job. I’ve been taking my usual walks to the basement of the BHV Department Store for screws, drill bits, door knob parts and such, taking on the little “brico” jobs. We bough a fax machine last week; I can’t believe we have a fax machine in this day and age, but now we actually have a little office set up in the entrance hallway (Degagement), with a copier, scanner, color printer and a fax machine. And, I tried out the kitchen a few days ago and cooked a braised turbot. It was delicious. The ingredients over here are much different than back home. Tomato paste comes in a toothpaste tube, which is a lot easier to store after you use that one small teaspoon. Chicken stock comes in a cube. There is no such thing as a can of broth or a box of stock. You boil the water and throw in a few bullion cubes. It’s the old fashion way and it works great, except that the bullion cubes a little too salty for my taste. The vegetables are all fresh and beautiful and the meats and fish are amazing. The crazy thing is that you can get a good meal in a fairly good restaurant for about the same price it costs to cook a meal at home. No wonder everyone goes out to eat all the time. One day, we took a walk through Paris, starting in the Marais, over to the Champ du Mars and the Eiffel Tower, back through the Pont Alma tunnel where Dodi and Dianna died in the car crash, back through the crowds of people in the Tuilleries, through the cavernous city mall known as the Carousel du Louve, on by the Pompidou Center and back home. It was an 8 hour walk through Paris. And a 9 hour great night’s sleep. Our friends Paola and Fabrizio came to visit and celebrate Paola’s 50th birthday. We were really excited to show them our town and started out with a visit to Place des Vosges to watch the filming of a movie. This was the second costume period film we ran into in Europe this year. I’m surprised we haven’t seen more of them. 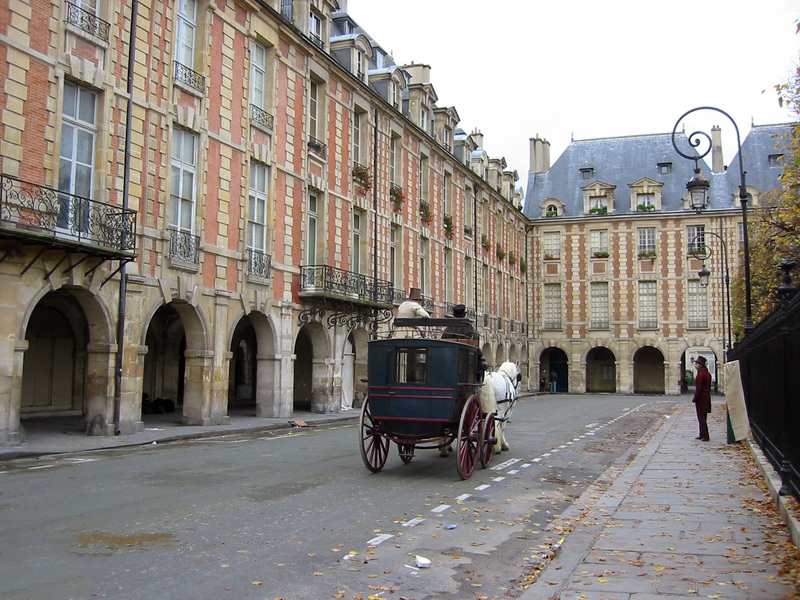 Place des Vosges is a great filming location and in many way a movie set. From a distance the harmonious brick buildings and arcades paint a perfect picture of the 17th century. 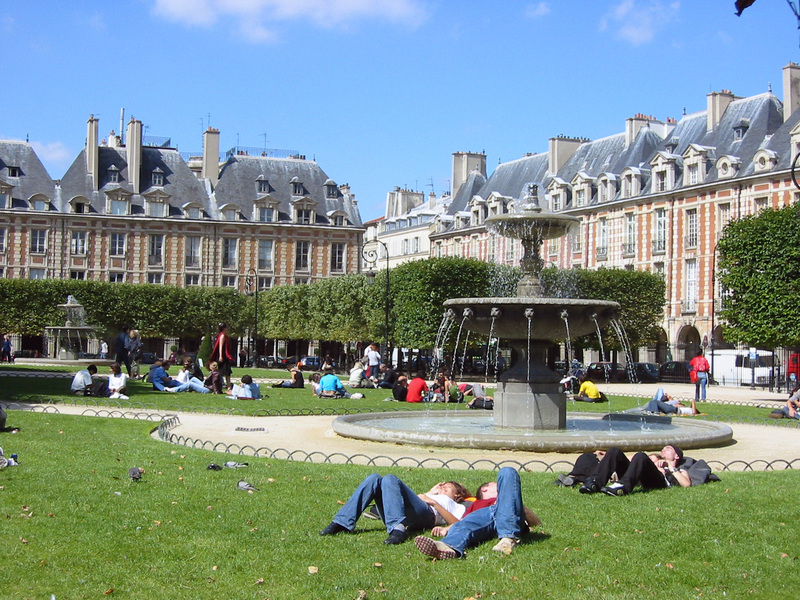 Place des Vosges was the first public square in Paris. 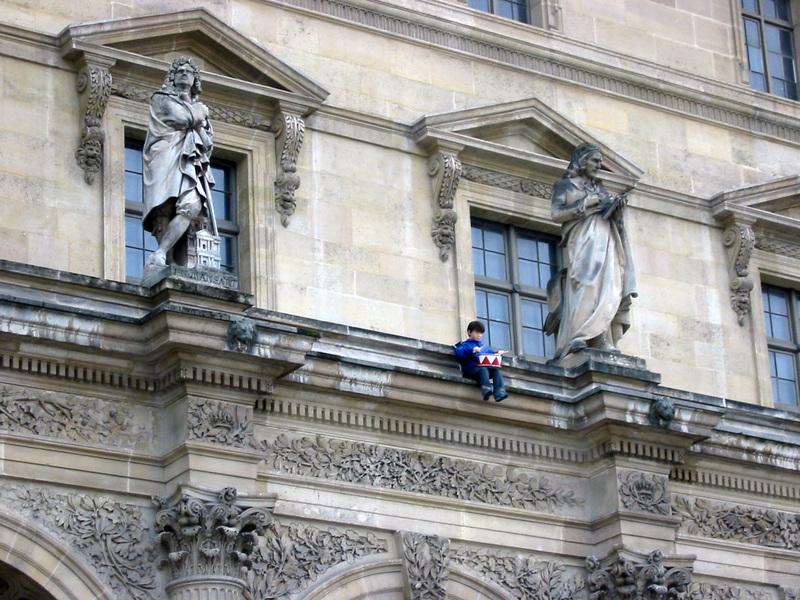 When then King Henri IV decided to allow members of the court to build around the square in the early 1600’s, the building code and design included brick face. It was a nice look, unusual for Paris at the time and really expensive. Many of the aristocrats decided to save some money and just stucco the exteriors and then come back and paint them to look like brick. There are a few buildings faced with old red brick, but if you take a closer look, you’ll find that most of the buildings around the square are painted. You can actually see trails of red paint melting from the building exteriors.The harmonious buildings are really like a stage set. Our friends were charmed by the film crew and the actors, but they were too eager to get out and hit the streets, and mostly the shops. And so for the next three days, Fabrizio, Nino, Gretchen and I walked the streets of Paris for 6-7 hours a day, following Paola and Pina on a mad shopping spree. We walked past the Notre Dame into the 6th arrondissement. We walked over to the Bon Marché and into the 7th arrondissement. We took the Metro to the grand antique markets at the Marché au Peuce and walked through close to a 100 antique shops. We walked to through the Louvre, the Tuileries, the antiques at the Carousel du Louvre; on through Place Vendome and to the Grand Magazines. We walked past the Notre Dame into the 6th arrondissement. 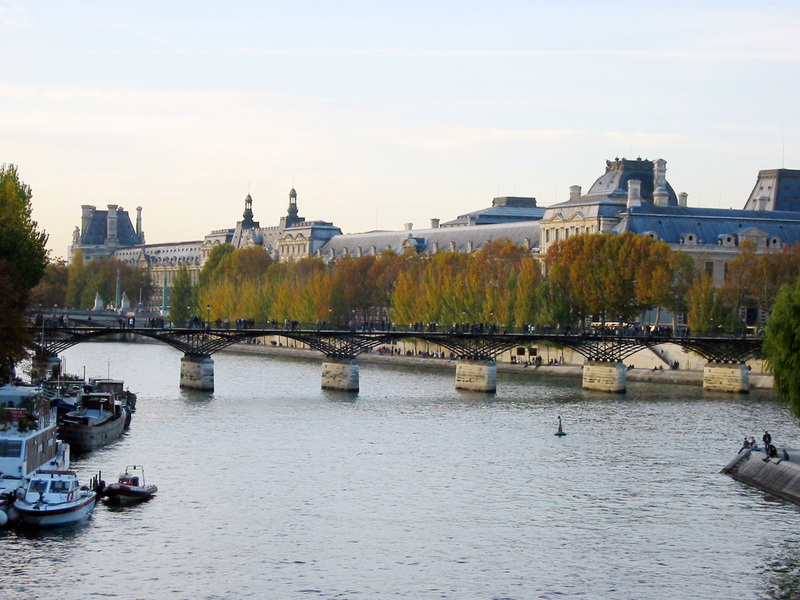 We walked over to the Bon Marché and into the 7th arrondissement. We took the Metro to the grand antique markets at the Marché au Peuce and walked through close to a 100 antique shops. We walked to through the Louvre, the Tuileries, the antiques at the Carousel du Louvre; on through Place Vendome and to the Grand Magazines. We covered the street market at Richard Lenoir, and then, there were the hours of boutique hunting in le Marais. One night, we all were literally crawling back to the apartment after a full 7 hours of shopping. Fabrizio, Nino and I were ready to pass out, but Paola and Pina couldn’t stop. As long as the lights were on and the door was open, they had to go in. 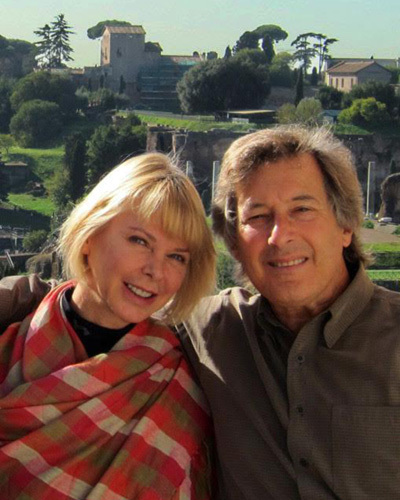 If they were Americans, they would have been loaded down with bags and boxes, but the Italians preferred to look. Oh, they bought a few gifts for their kids and the collar for the family dog, but in the end, the only thing they brought back from Paris to Florence was duck paté, lots and lots of duck paté. We were sad to leave Paris. Neither of us wanted to go. It was as if we were just getting started. Actually, we’d just gotten started on the process of sacking our Syndic. For those who don’t know about Syndications or Syndic for short, every building in Paris has one. These are the managing companies hired by the apartment co-operative to look after the well being of the building and the common areas. Like a condo society in the US, every apartment is responsible to pay a monthly fee to cover repairs and general cleaning. On larger repairs or renovations, there must be a majority vote of all the tenants before any work will be done. Our syndic hasn’t even called a meeting for 2 years. When we moved in, most of the tenants had been living there for over 50 years, and everyone was very content to let the common areas, let’s just say “evolve”. But soon after, many of the older residents either moved on (or died off) and a lot of younger (and more gentrified) blood has moved in. We want to bring the old 19th century girl into the 21st century. And so we are back home in San Francisco now. We are receiving email from our neighbors at 62 rue des Tournelles, telling is that we now have a majority vote to dump the old Syndic. Things are moving forward, even without us.